The New American Trend; Being 100 Pounds Overweight. When I talk about obesity I hope everyone knows I am not ‘shaming’ anyone. I struggled keeping my weight down for years and found that by becoming a vegetarian, all the work was taken out of that mess. So when I do choose to shed light on America’s horrific obesity problem, I am only doing so with intentions of helping. I just want to let others know that it is possible to turn it around. One of my clients, as of now, needs to lose 120 pounds and I am taking on a second who needs to lose over 100 as well. So being 100 pounds over weight is unfortunately not uncommon these days and it is actually becoming the new norm. 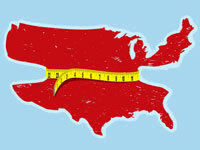 Since the year 2000, there has been a 70% jump in American’s who are 100 pounds over weight. And though many studies say that the obesity epidemic is leveling off, other facts and studies are showing us just the opposite. In 2000 about 4% of the population was 100 pounds over weight now we are at about 7%. 7% of the American population is about 22 million, so that means about 22 million Americans need to lose at least 100 pounds. That is really bad. That is a really big number and that is a really scary number. If this does not show us how huge our problem has gotten, literally, then I don’t know what will. When one is 100 pounds overweight precautions need to be taken when it comes to exercise, making the first plan of attack a diet change. My client lost 22 pounds in 3 weeks but changing his diet. No more soda, no more heavy chicken parm and no more beat down carbs. Instead its oatmeal for breakfast, carrots, celery and hummus for a snack, a big salad Greek yogurt for lunch then a lean protein for dinner. If even one does not go totally veg, that is ok, this is all a step by step process and we do not want to overwhelm anyone. Once some of the weight comes off from diet then it is time to hit the track and start walking or join the gym. Then you will be well on your way. A big qualm of over weight people and the gym is that they think everyone is staring at them and making fun of them. It is actually the total opposite, we are HAPPY for you and ready to encourage you. I tell all my clients this, that super fit man or woman on the treadmill next to you may have been just as heavy as you are a few years back. I am living proof of that, you would never be able to tell that I tipped the scales at 180 (I am 5’4”). These days, I am that fit woman at the gym and no I am not staring at you but you best believe I am cheering you on. ← For Your Monsters: Cadet Sweet Potato Steak Fries. Setting realistic goalsYou are way more likely to succeed in weight loss if you set realistic goals. A perfectly healthy rate of weight loss is 1-3 pounds a week. The heavier you are when you begin, the more weight you’ll lose. Anything more than 3 pounds a week without medical supervision means that you are probably losing muscle mass as well. So no, losing 50 pounds in a month is probably not an attainable goal.Instead of thinking “Oh my god I have to lose 30 pounds in 4 months how am I ever going to start!”, divide up your goal into mini ones. Aim for 5-10 pounds a month, and soon it will seem less daunting.Make sure your ultimate goal weight is also something that you body can reach. For example, if you’re 5’8” with a large frame, you’ll probably never be 100 pounds unless you resort to unhealthy methods. Your health is more important than how thin you are!